According to FT.com report and news from an investment conference last month, Corzine made the statement that MF hoped to double to 4,000 employees within a couple of years from an aggressive move into investment banking and money management. Now that's a very aggressive statement and very atypical in the financial sector these days where most institutions are expected to decrease in size. MF has the potential to skate under the radar and take share from bigger rivals that face much stronger regulation scrutiny. Hence, the initial position into MF on September 30th [Trade: Bought MF Global]. While the targets of MF seem overly aggressive and likely wrought with risk, Corzine has the connections and experience to make this happen providing MF with the risk/reward potential Stone Fox finds appealing. The Q2 report was also encouraging showing a profit for the first time in 5 quarters. Corzine was able to initiate a restructuring that helped reduce compensation ratios while also increasing revenues. An impressive start to his tenure, but now its still to be seen whether they can capture new business. 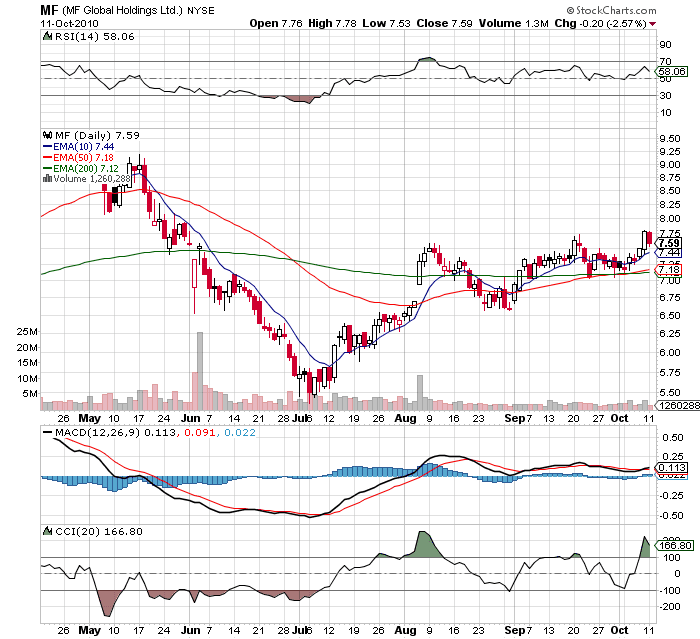 MF has a global background and vast experience in the natural resource space providing an ideal platform for growth.Capturing that growth won't be easy, but unlike the analysts in the FT.com article I expect MF to have less trouble breaking into the industry. All eyes will be on execution over the next 12 months. Not being related to a financial crisis institution will surely help but its possible that clients and the media could paint a negative picture of a firm now entrenched with Goldman Sachs executives. Time will tell, but for now the huge potential reward far outweighs any downside risk with the stock in the mid $7s.